A month ago, we did an analysis on Liverpool’s goalscoring under Jurgen Klopp, drawing the conclusion that not only had he improved the attack since taking over from Brendan Rodgers, but was also doing so to a level which would nearly guarantee a top-four finish over an entire season. Now, take a deep breath…it’s time for the opposite end of the pitch. We can begin this article with the same sentence as last time, for it remains a relevant debate: Is it goals or is it clean sheets which win games, points and trophies? Before delving into the murky world of Liverpool’s defensive resilience—or lack thereof—it’s worth updating the goals for department to see if the Reds are still on track, five games later. Impressively, each of those five matches have been won by Klopp’s side, with 16 goals scored against Leicester, Chelsea, Derby, Hull and Swansea. It means a total of 61 competitive matches in charge for Klopp, with 113 goals scored at an average rate of 1.85 per game—up from 1.73 when last we checked. According to our findings from the goalscoring article, the average for a fourth-placed finish across a five-year spell has been 1.78, so things continue to look good in that regard. Now, onto the goals conceded. We’ve seen that Klopp’s overall total is is around that mark, and for this season alone the team averages 2.9 goals per game, a completely ridiculous total to be entirely honest. If the average is still somewhere around that after upcoming games against Manchester United and Tottenham Hotspur, be very excited. So, is the defence bad enough to negate that attacking threat over the course of a season and stymie the Reds’ top-four challenge? In his 61 competitive games, Klopp’s Liverpool team have conceded a total of 68 goals, that’s 1.11 goals per game against. Up against Rodgers’ last 61 by comparison, it’s almost exactly the same: 70 conceded by the Ulsterman’s team in that time frame (1.15 per game) and 82 conceded in Rodgers’ final 69 games (1.19 pg), which dates back to the start of 2014/15. So, at the very basic level, is the defence better in Klopp’s year in charge than in the final year under Rodgers? Nope. But football analysis is never quite that simple, is it? Taking a closer look at Klopp’s time in charge gave far more valuable insights in the goals scored section, so what about goals against? A 61-match haul to date means we’ll split tenure 31:30, simply to not immediately alter the midway point match after the next fixture, where accurate comparisons can still be drawn from the same data set. As it turns out, a simple conclusion can be drawn: Liverpool aren’t any better defensively under Klopp now than they have been at any point previously. No downward trend, no significant drop in goals conceded between his early spell in charge and his current one…and fewer clean sheets. That, at least, can be explained in part by the run of fixtures: the most recent set of 15 games (47-61) encompasses late-season Europa League action, naturally against the better sides the Reds faced, as well as the tough away games at the start of this term. Either way, the signs are there that Liverpool are not getting better yet, and if anything have slightly regressed. Certainly, there cannot be much of an argument that the team are better, more regularly, than they were under Rodgers. So with the goals being conceded not on a downward trend with Klopp yet, how much of a barrier will it be to breaking back into the top four and pushing for titles? The table below compares the last five years of Premier League defensive records at the top end of the table. The outlier is easily identified: the Reds’ title challenge under Brendan Rodgers, when the attack was irrepressible but the defence, ultimately, a liability. That only two teams dating all the way back to 2002/03 season—15 years ago—have finished in the top two with a goals against record of more than 1.0 tells you all you need to know: if you want the title, get that goals against column down to very close to one per game, and even then only if you have a stellar attack. Broken down against two key rivals, Liverpool’s defensive woes only look worse as time goes on. The below graph shows goals conceded per game in Premier League matches only, across four different time periods: Rodgers’ three full seasons, last season shared by Rodgers and Klopp, across the 37 league games Klopp has been in charge for and the current campaign. 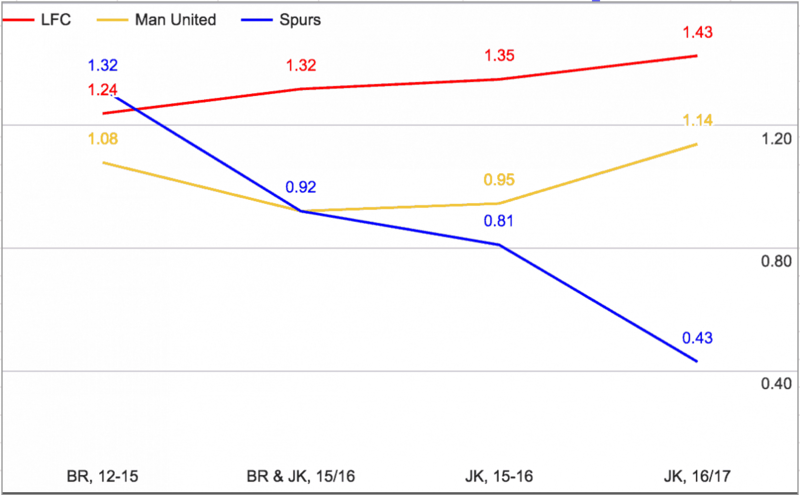 Spurs’ downward trend is incredible, though exaggerated by the small sample size of this season so far, while the Reds are finally back above Manchester United with some consistency—but not in the column fans would hope for. There’s not much to be confident about in terms of progression thus far under the German, with one single, albeit potentially large, point to note: only now can comparisons with his first-choice back five begin. Loris Karius‘ return from injury, Joel Matip being a regular at centre-back and James Milner playing at left-back are all new additions the back five for this season, and only for the past few weeks have they all been in place. Can we ban set pieces? Now for the shocking news everyone has been waiting for: Liverpool are diabolical at defending set pieces. Indeed, no other method—using the same six characteristics from our “goals for” article—of the opposition scoring against the Reds even comes close to matching the tally of goals against by way of set pieces. Controlled build-up play originating in the attacking third (Liverpool’s defensive third). Even adding together all opposition build-up play, whether from in the attack or from in their own half, the total combined barely beats the tally of goals the Reds have conceded off set plays—and for full transparency on the total, the late goal conceded at Norwich City in the 5-4 win was marked down as a long ball, as that’s what it was, hit and hope rather than a set play, despite it being from a free-kick. 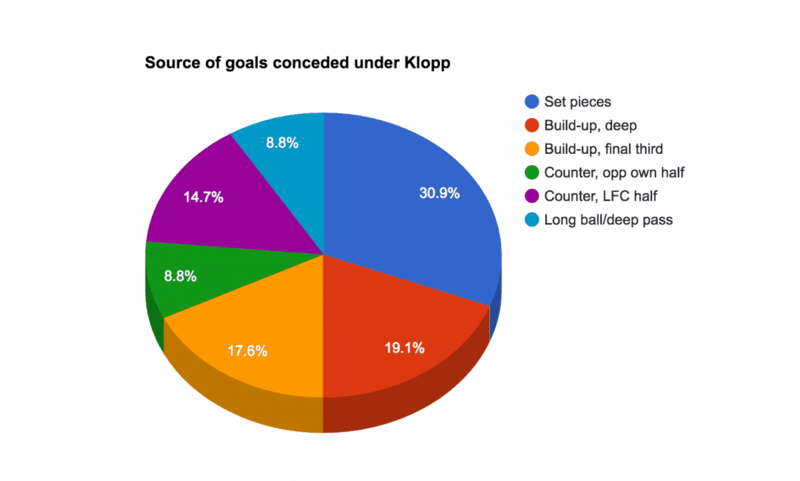 Anyone preferring to call that goal in particular a set piece bumps the figure up to 32.3%, or very nearly one-third of all goals conceded under Klopp. Of those set pieces, 13 were conceded from corner kicks, a hideous continuing weakness of Liverpool’s. A muddled defensive strategy and an inability to win the first ball is contributing most of all to the Reds’ woes in this regard: from the 13 goals off corners, very few were actually scored with the initial header from the corner, yet Liverpool won the ball—touched it, headed it, parried it, half-cleared it—only twice. The other 11 occasions, the opposition attackers were first to reach or react, and often scored from the second or third touch after the initial drop. Beyond that, there’s not much to say other than the entire aspect of defending corners hasn’t been great: five were delivered to the back post, three to the near and five were right in the middle of the six-yard box. Two of those goals were conceded in the same game against West Brom, while two more were Adam Bogdan specials: a dropped catch on his goal line against Watford, and the infamous Exeter corner which went straight over his head and into the net. So far this season, Liverpool have conceded twice from corners (Swansea and Hull) and have faced a total of 29 in league play and a further nine in the EFL Cup. Thus, they have conceded at a rate of once from every 4.5 matches, or every 19 corners faced in all competitions. The other 11 conceded under Klopp covered a span of 52 games (once every 4.7 games) and 225 corners: one conceded every 20.5 corners faced, so no progress has been made in Klopp’s year in this regard. In the league, where it really matters most for Liverpool this season, it’s grim. The sample size for the season so far is relatively small, but already there’s a clear outlier. Whichever way you look at it, it doesn’t make good reading for Liverpool. There exists no foolproof method of defending, against any situation in football; whether zonal marking, man to man or a combination of both, some corners will end up as goals. The idea is to limit the risk which exists and, over time, to gradually improve each aspect of the side. In defending corners, Liverpool have not improved under Klopp as time has gone on and it’s a (relatively) simple area the team can save themselves points and anguish with if a solution can be found. The big saving grace has to be that for all the defence has not improved, or even marginally gotten worse, the change is far smaller than the change to the attacking numbers, which is hugely positive. Taken together as they must be, it means that Liverpool as a team, an overall unit, are faring better under Klopp—but there’s still plenty to work on for major honours to arrive with regularity.